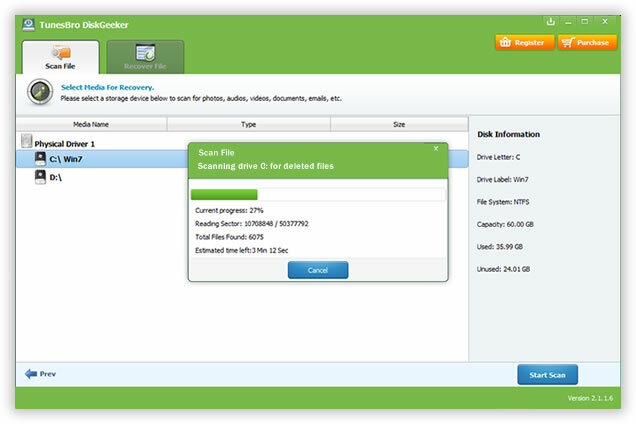 With its intelligent data recovery engine, DiskGeeker can quickly scan all deleted or formatted data on any disk. It can be a hard drive, SSD, USB flash drive, camera memory card or SD card. 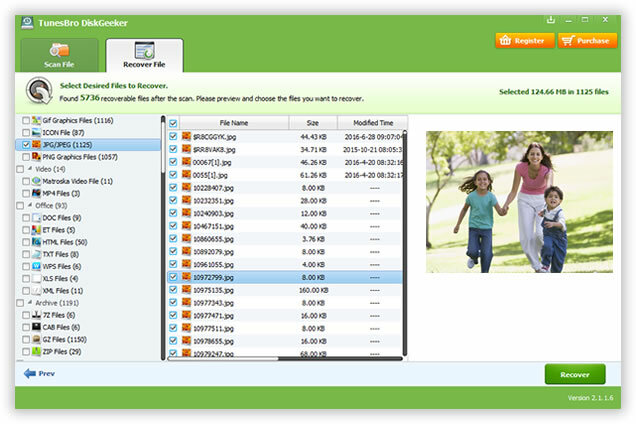 It is a great help to recover deleted photos, videos, music, documents or other types of data within the minimal of time. Tunesbro DiskGeek can help you get back the data with high success rate. Fully recover lost data due to accidental deletion, disk formatting, system crash, virus attack, OS reinstall. Even Support retrieving deleted data from missing volume or partitions. Restore deleted files from normal deletion, system crash or emptied trash bin. Completely retrieve formatted data due to disk formatting or system reinstallation. Recover deleted files or lost data due to system crash, blue screen,	hardware	failure. Fully recover all lost data after virus attack with the built-in algorithm. 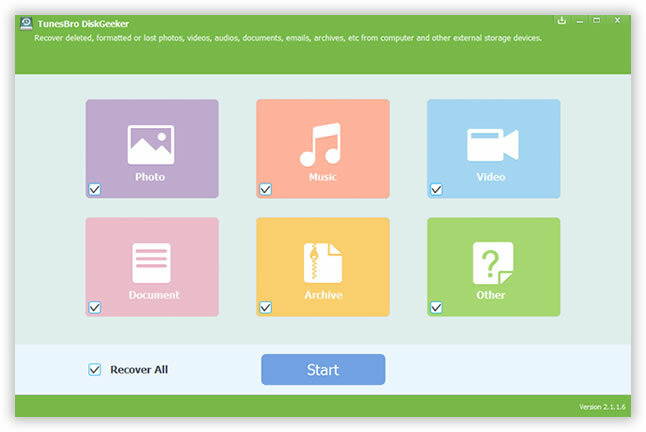 Easily recover deleted photos saved on a computer or from camera, include JPG, PNG, GIF, RAW, CRW, NEF, ORF. The video recovery engine is the best friend in here. Support all video formats like MP4, AVI, MKV, FLV, WMV, 3GP. Fully recover all kinds of music files no matter it was downloaded from online or ripped from CD, such as MP3. Directly retrieve overwritten or deleted Word, Excel, PowerPoint from Office and HTML, HTM, PDF, PAGES. Completely recover RAR, ZIP, RAR, BZip2, 7z, SIT, SITX and more. Files generated by well-known programs can be also recovered, including Photoshop, AutoCAD, 3D-Max..
Hard Drive Seagate, WD, Sandisk, Toshiba, Samsung, HGST, PNY etc. Dell, HP, Lenova, Asus, Toshiba, Samsung, Acer, MSI, Sony etc. SanDisk, Samsung, Kingston, Sony, Olympus, Toshiba, ADATA, etc. Canon, Nikon, Fujifilm, Kodak, Sony, Olympus, Panasonic etc. Kingston, SanDisk, PNY, Sony, ADATA, Transcend, HP, Corsair, Memorex etc. Walkman, iRiver,FiiO,Pono, Zune, Samsung, Philips, Astell & Kern etc. Seagate, WD, Sandisk, Toshiba, Samsung, HGST, PNY etc. 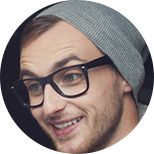 User happiness is the most important thing we are targeting in Tunesbro. That is the reason why DiskGeeker is so easy to use. With its clean and intuitive user interface, everyone can use the program freely and comfortably to recover the lost data. It is one of major differences between Tunesbro and its competitors. Customer satisfaction is always our first priority. The Dev team has spent a lot of extra on optimizing the program to its maximum potential in order to reduce the recovery time. So you don't need to wait for much time before fully recovering your data. Plus, there is no hidden risk by using the program as it was already tested without any problem by hundreds of volunteers. "I have to give my sincere appreciation to the team. DiskGeeker helped me recover all the deleted photos on my computer due to system crash. I tried a couple of other programs but DiskGeeker is the final one I go with because of its powerful recovery feature and easy of use." We offer 30-Day Money Back Guarantee on all software. All software is virus free. All transctions are protected by SSL. Successfully helped thousands of users solve data security issues. 24 x 7 Email help & Live Chat.